President John Adams approves legislation to appropriate $5,000 to purchase “such books as may be necessary for the use of Congress,” thus establishing the Library of Congress. The first books, ordered from London, arrived in 1801 and were stored in the U.S. Capitol, the library’s first home. The first library catalog, dated April 1802, listed 964 volumes and nine maps. 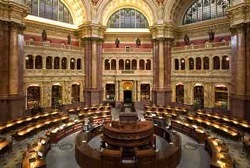 The Library of Congress is the largest library in the United States. It features 883 miles of shelving, houses 155 million items total, and holds 33 million books that are written in 460 different languages. It’s also home to 68 million manuscripts, 6.5 million pieces of music, more than 5 million maps, over 3.4 million recordings, and more than 13.5 million photographs.